The NCAA football season kicks off on August 25. 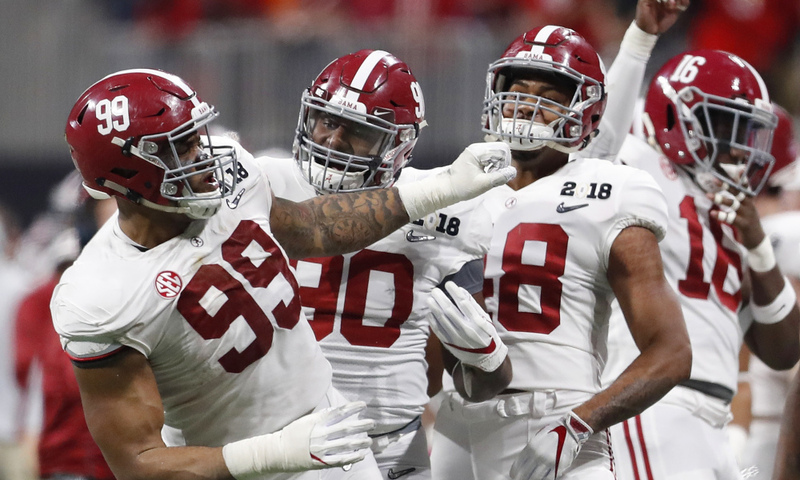 According to top sportsbooks, the Alabama Crimson Tide have opened up the betting season with the best odds to win the NCAAF 2018 National Title. Nick Saban’s Alabama is +225 to win the title for the second season in a row. Only three colleges have won the NCAAF National Championship. The other two are Clemson and Ohio State. The two programs had great 2017 seasons and sportsbooks have picked both as second and third favorites to win the National Championship, respectively. Clemson starts the season at odds of +600 while Ohio State is listed at +700. Georgia and Michigan round out the top five odds at +800 and +1100, respectively. Is there a chance Alabama doesn’t repeat as champions? Well, maybe… but it is doubtful. A number of NCAAF 2018 insiders believe Alabama can run the table. Since 2011, the Crimson Tide has won 11 or more games in each season. The last time — and only time during that time period – Alabama ran the table was in 2016. Week 9 against the LSU Tigers and week 12 versus the Auburn Tigers could be the trickiest games on ‘Bama’s schedule. Don’t put it past the Crimson Tide to win all of their games. If there is a hiccup, it could actually come in a game other than what is perceived as the ‘big two’ in 2018. Clemson has won 11 or more games in each of the last three seasons. The Tigers aren’t at the level as Alabama, but they are pretty darn close. Clemson’s defense has eight returning starters, which may make it the best in the nation on paper. NCAAF 2018 insiders believe Clemson’s only hiccup could come in week 7 against North Carolina State. Eleven wins should be reachable again by the Tigers. Sportsbooks have set Ohio State’s over/under at 10.5. The Buckeyes won 10 regular season games a year ago. The team did win twice in the postseason, but the Big 10 regular season was a disappointment for Urban Meyer. Ohio State hasn’t reached the National Championship Game since 2015 when the team won it. Georgia was the surprise performers of 2017. The Bulldogs made the National Championship Game and nearly knocked off their SEC rivals Alabama. Can Kirby Smart get the Bulldogs back into the National Title picture? That is the question on the minds of all Georgia supporters. Michigan shocked bettors in 2017 with an 8-4 season. It seemed uncharacteristic under Jim Harbaugh, who had led the team to 9-3 and 10-2 seasons in the two previous years. Michigan’s over/under has been set at 9 wins. Odds of under 9 wins is currently at +115, according to Las Vegas sportsbooks. The Wolverines’ schedule doesn’t look easy and a repeat of last season is realistic. I have no deep knowledge about NCAAF teams, but with Zcode i can make profit anyway! awesome! That's an awesome team love the Texas College! They all have a shot, because each team has holes.